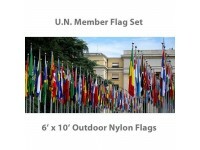 100% American MadeSolarMax 200 denier nylon designed specifically for active outdoor useFully Printed. Our aniline-dyeing process duplicates complex flag emblems with exacting accuracy .. 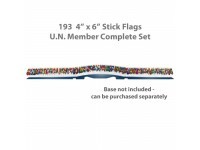 Complete Flag Set of All Members of the United Nations plus U.N. flag - 193 FlagsPrinted on 4in x 6in Silk-Like Rayon - Highest qualityHem Stitched on All Four SidesMounted on 3/16in x 10in Blac..